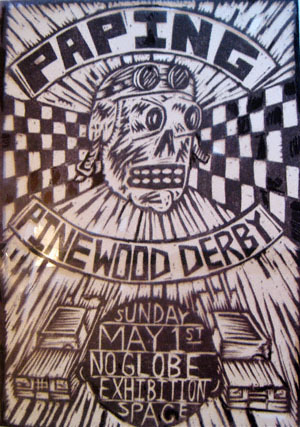 If you get a chance and are so inclined we would like to invite you and the mister to the first ever Paping Pinewood Derby at No Globe Exhibition Space on May 1st. Paping is a comic zine collective that previously brought the Soapbox Derby to Brooklyn Heights. Due to an exceptionally popular 3rd year field that gathered maybe a little too much attention, as in the po-po, it was necessary to conceive of a new format. After several years absence a new Paping race is coming to our humble Greenpoint space. Artists from far and near will be contributing cars to race for glory on a Sunday afternoon, 3pm till racing is finished… …you can check out past glories here. May 1, 2011 starting at 3:00 p.m.